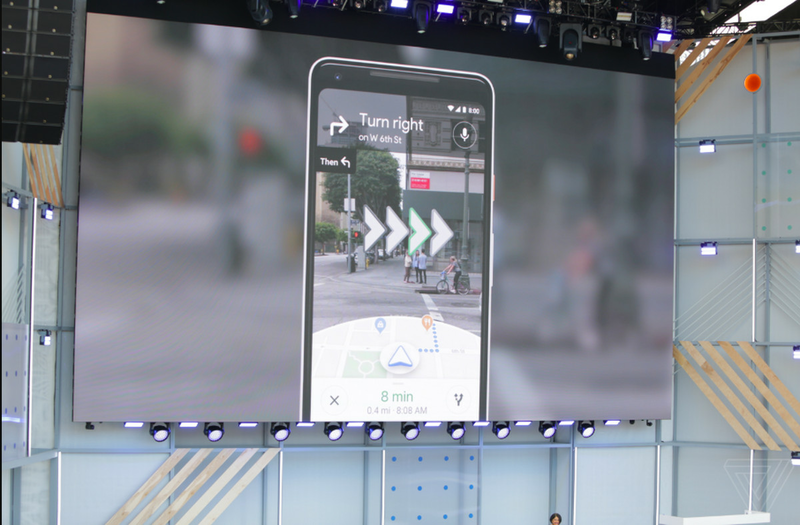 Google showed off new features for Google Maps at I/O today, including an augmented reality Street View mode to help you follow directions in real time, along with personalized recommendations to help you discover places in your neighborhood. The new AR features combine Google’s existing Street View and Maps data with a live feed from your phone’s camera to overlay walking directions on top of the real world and help you figure out which way you need to go. It’s a lot like the promises Google had made with the original version of Google Glass, except without the need for wearing an additional AR headset. In addition to directions, the new AR mode can help identify nearby places, too, and Google is even testing adding a helpful augmented reality animal guide to lead you along the way. It’s not entirely clear yet whether or not this is a tech demo or a product that will end up on our devices in the near future, but it certainly seems like the natural place for Google’s machine vision tech to go. Google is also adding more social features to Maps, making it possible to share multiple places to friends with a single action, and vote on them together in real time to decide where to go without having to leave the app. The new social and recommendations features for Maps are set to come to both Android and iOS later this summer, with no release date announced yet for the augmented reality directions.